3,3 - 4..........Lump von Hagenstolz. 3 - 4.............Carmen vom Felsingpass. 3 - 4.............Cäsar vom Klockenhof. “Armin Meckie vom Roten Feld was a black German bred male who won the Bundessieger-title in 1969. Many people were impressed with him and no one was surprised to see him go Best of Breed. He had a good temperament and passed Schutzhund III with ease. Kandy: SchH 3 and passed the Körung. 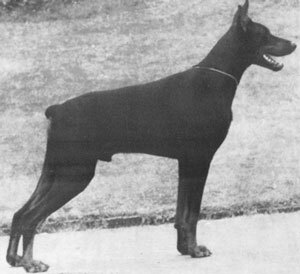 He is sire of the vom Nettetal “A” litter (Anuk).